Asian stock markets started the week with fresh selling, with Chinese shares lower following Thursday’s slump and the Korean market weighed by heavy losses for Samsung Electronics. 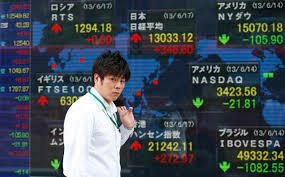 Chinese equities sent a shudder through global markets on Thursday when leading stock indexes there tumbled over 2%. The market rebounded Friday but Monday saw fresh downward pressure. The CSI 300, which consists of the biggest stocks in Shanghai SHCOMP, -0.85% and Shenzhen 399106, -0.58%, fell 1.2% though both the cities’ individual composite indexes fell less. The decline weighed on equities elsewhere after some modest early gains. The Nikkei NIK, -0.38% rose as much as 0.5% shortly after the open but was recently down 0.3% as the yen rebounded again; the dollar fell to ¥111.45 from ¥111.70 earlier in the session. Australia’s benchmark XJO, +0.10% also turned slightly lower after ticking up earlier. Hong Kong’s stock benchmark HSI, -0.51% fell 0.6%. Korea’s Kospi SEU, -1.30% was recently down 1.4% weighed by a slide for Samsung Electronics 005930, -4.44%. The tech behemoth, which is by far the index’s biggest component, surged more than 50% this year but was down 4.5% in early trade after Morgan Stanley dropped its rating on the stock to equal-weight from overweight. Morgan Stanley cited the doubling of its shares since early 2016 and signs that the flash-memory industry has started to weaken. “We expect a steady stream of positive growth data in Asia this week — from Japan and South Korea’s industrial production to Australia’s capex and India’s GDP,” said Klaus Baader, head of research for Asia at Société Générale. Holding up Monday was New Zealand stocks. The NZX-50 NZ50GR, +0.56% climbed 0.4%, with Auckland International Airport AIA, +2.46% and a2 Milk ATM, +1.68% advancing 1.5%. Oil prices turned lower in Asian trading Monday after climbing further to end last week. January Nymex WTI futures CLF8, -0.46%, which finished Friday at a fresh 2½-year high, was recently down 0.4% at $58.69 a barrel.